It’s been a while but Ukkonen is back with some new ambient tunes to ease my fevered brain. I think I might be a bit stressed. Had this odd dream about someone asking me to skin an onion but only topping and tailing it and then to put the quartered onion back in the skin without breaking it. This sounds even weirder in the writing than the dreaming. Anyhow, back to Ukkonen. Not one but two offerings – a four track 10″ and a track on a comp. Let’s start with the comp. Ukkonen appears on Dots vol2 with Davor, Shlomo and Langer. Still wipes the floor with them. Terophase is a lovely bit of ambient. A bit Global Communication, with everything just a little bit out of phase but pastorally gentle. Buy the comp here (£7) vinyl only. Secondly, Change Time. This 4 track EP (available on vinyl) although only just released contains tracks which date, I think, originally from around the time of The Ancient Tonalities of… album. Ukkonen says “once again I want to change direction a little, whilst still keeping all the things I love in there – the polyrhythms, phasing loops, ambiguous timings and so on”. First Lunation is the centrepiece of the EP, clocking in at 10 minutes. For those that like to find meaning in these things, Lunation is the mean (average) time for one lunar phase cycle (i.e., the synodic period of the Moon, or the amount of time from one new moon to the next). This is a gradually epic track, with the uneven lunar cycle of the title a match for the shifting rhythms that Ukkonen so enjoys. Never has 10 minutes flown by so fast. Also astronomy based, Tonal Syzygy offers a move away from ambient to a piano-based offbeat house. Agogic Helia is the closest to the ancient tonal feel of The Ancient Tonalities of… album but with added bleep. Change Time offers a slightly elegiac feel to the ambient, with lower tones marking the passing of and mourning for what has gone before. Another beautiful addition to the Ukkonen canon. Blurb: Following the critically acclaimed LP’s “The Isolated Rhythms of…” (on Uncharted) and “The Ancient Tonalities of…” (on No Pain In Pop) and the EP’s “Erriapo”, “Spatia” and “Aika”, the mysterious Arctic producer known only as Ukkonen delivers his latest set of stunners. His credentials are clear, even if his origins aren’t – apparently a background steeped in classical composition in a remote area of Finland and ‘pretty much zero interest in dance music’ somehow led to all this; confounding expectations from critics worldwide, who have compared his unique non-linear grooves to the likes of Gas, The Sight Below, Mark E, Aphex Twin, Brian Eno, Carl Craig, Mika Vainio and Isolee; as well as gaining DJ support from the likes of Agoria, Ame, Colin Dale, Norman Nodge, Terry Mitchell and Vince Watson. Invited to remix Patten before the latter signed to Warp, heads were also turned by a slew of mixes that went far beyond the average DJ set, where he ‘Ukkonised’ classic Detroit techno tracks, re-editing them into his trademark off-kilter time signatures whilst somehow retaining all the original soul and groove. Returning to his original home for this EP, it represents yet another left turn on the Ukkonen musical path. The man himself says: “once again I want to change direction a little, whilst still keeping all the things I love in there – the polyrhythms, phasing loops, ambiguous timings and so on” however this set sees the tempo looser than before. We’re not sure if “post techno” actually ever happened, but maybe “post discotronica” is, er, in the post. 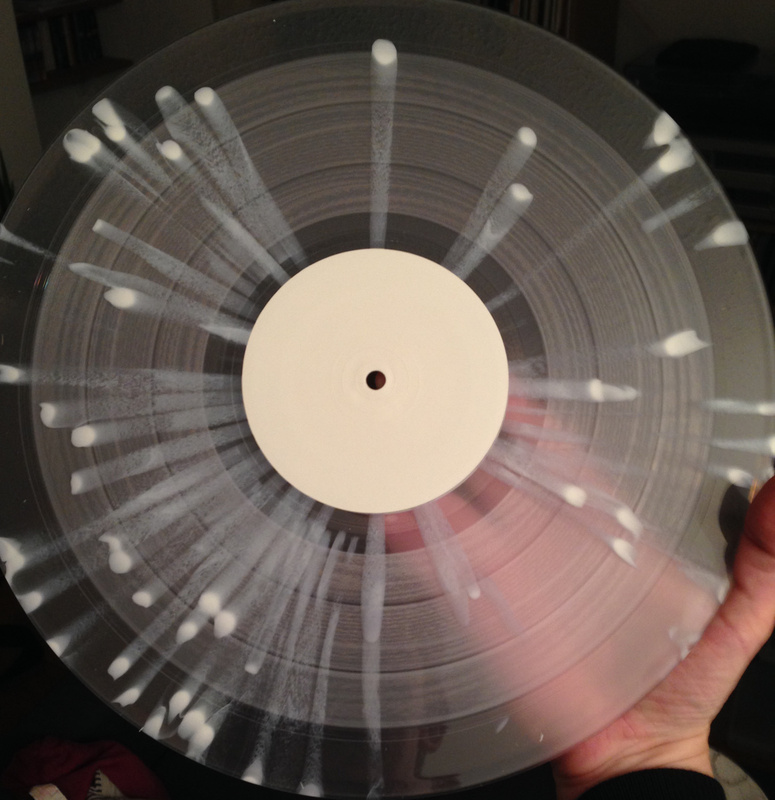 Anyway, we liked the tracks so much that we once again went the extra mile with the physical product – a transparent and white marbled thing of beauty, cut to 10” size in a 12” pressing. ~ by acidted on October 27, 2014.